Nick Tandy and Patrick Pilet came within one lap of taking Porsche North America Racing’s fourth consecutive United SportsCar Championship win this weekend at the Lone Star Le Mans event in Austin, Texas. The works Porsche 911 RSRs have dominated proceedings in the US series recently, with the no. 911 entry of Pilet and Total 911 columnist, Tandy triumphing at Mosport, Road America and Virginia International Raceway. At the Circuit of the Americas in Texas, the Anglo-French duo’s run of success looked set to continue as Pilet saw off championship rivals, the no. 25 BMW Z4 of Bill Auberlen and Dirk Werner, to take Porsche’s fifth USCC pole position of 2015. 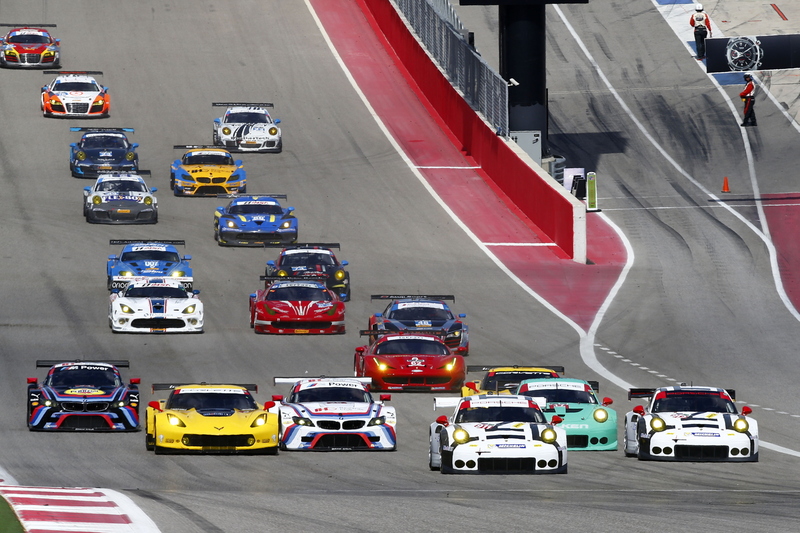 As soon as the green flag waved, the trio of GTLM Porsche 911 RSRs headed the field at Circuit of the Americas. Proving it not to be a flash in the pan, Earl Bamber managed to place the no. 912 Porsche 911 RSR third on the GTLM grid, and was confident that a front row start would have been possible if it hadn’t been for traffic. When the two-hour, 40-minute race went green just after midday on Saturday, the two factory 911s immediately led the field away, with Bamber jumping into second followed by the customer Falken Tires 911 RSR of Wolf Henzler. In baking conditions (where track temperatures hit 60 degrees Celsius), Pilet started working on building an advantage over his teammate as Bamber was left to fend off the charging Henzler. Nick Tandy (left) and Patrick Pilet (right) had been on course for a fourth consecutive USCC victory, a win that would have strengthened their title hopes considerably. The German managed to find a way passed the Kiwi 24 Hours of Le Mans winner on the same lap that Pilet was tipped into a spin by a prototype class car, wiping out the Frenchman’s six-second advantage and allowing the Falken 911 to take the lead. However, Pilet wasn’t to be beaten that easily, snatching back first position with a robust move later on in the lap as the two Porsche 911 RSRs went door-to-door around the 3.4-mile COTA track near Austin, Texas. Bamber would eventually make it back into second before the two factory Porsches pitted for their respective driver changes. All went smoothly in the pits, with Tandy and the no. 911 car emerging in the lead, a few seconds up the road from Jörg Bergmeister in the sister no. 912 machine. The defining moment of the race. The two Porsche 911 RSRs pit at the start of the final lap to take on a splash of fuel. As in the first half of the race, the white works cars set about building a small advantage over the field. However, in a race punctuated by just two brief safety car periods, it became clear that fuel consumption was going to be a deciding factor. Despite the best efforts of Tandy and Bergmeister, with just one lap to go, the no. 911 and no. 912 RSRs dived into the pitlane for a final splash and dash, allowing the no. 25 BMW of Werner and Auberlen to take victory in a race that Porsche had dominated. Tandy managed to finish third, limiting the no. 911 crew’s losses in the teams’ championship (where their lead has been cut from five points to three ahead of the season finale, Petit Le Mans at Road Atlanta on 1-3 October) while Bergmeister took fifth. For all the latest United SportsCar Championship news and reports, make sure you check out our dedicated motorsport section. 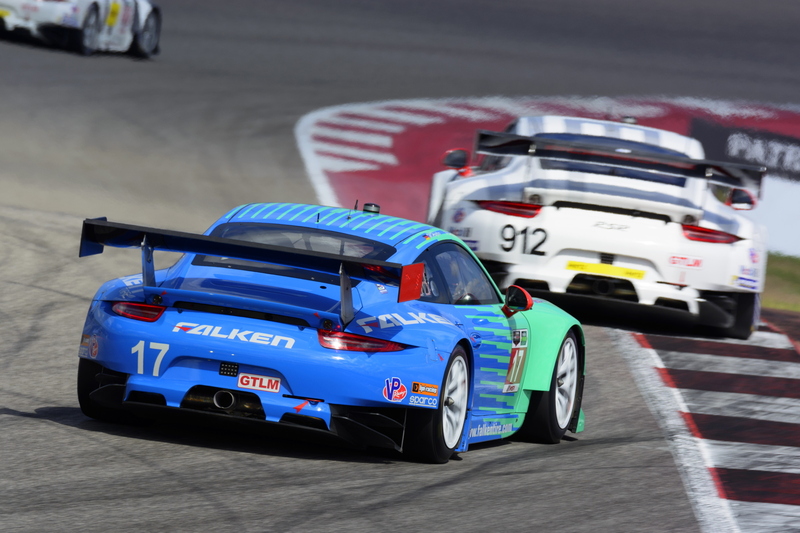 The Team Falken 911 RSR of Bryan Sellers and Wolf Henzler pushed the factory entries hard in Austin, Texas. They would eventually finish fourth.